Seeking to Diversify: Carl Campbell|! !| executive director of economic development with the Dalton-Whitfield County Joint Development Authority. Dalton and Whitfield County earned the title “Carpet Capital of the World” decades ago by nurturing an industry that eventually covered the globe. Its success provided jobs and security for thousands of workers. When the Great Recession dampened the demand for new housing, the downside of being a one-industry town became brutally apparent. These days, however, locals are expressing a new sense of optimism and the feeling that the bad old days are mostly behind them. Whitfield County, in Northwest Georgia, is a place shaped by history and geography. With a rocky landscape not conducive to farming and little access to outside capital, the region and its people focused on homegrown industries. The early production of handmade bedspreads evolved into carpet and floor coverings. Few could have imagined at the beginning of the 20th century that this fledgling business would eventually come to dominate the market. Today, fully 80 percent of the world’s carpet is made within a 30-mile radius of Dalton. He points to a recent upsurge in real estate activity, with more home building and new stores and restaurants opening in downtown Dalton. The hotels that crowd I-75 are mostly full these days with folks just passing through as well as visitors to the city. Most of all, people in Dalton are feeling inspired and hopeful as the carpet and floor-covering industry has begun to rise again. Legendary names like Shaw and Mohawk are once again expanding and hiring thanks to a slow, but growing residential and commercial demand. And, then there’s the rebirth of the other Shaw legend – Bob Shaw. Back in 2001, he sold Shaw Industries for $2.35 billion to Warren Buffett’s Berkshire Hathaway. For most men, that would be a career. Not Shaw. He had some ideas about how to make the carpet and floor-covering business work better. And, besides, he jokes, his golf game wasn’t getting any better. Despite a deepening recession, in 2010 he founded a new company called Engineered Floors and began implementing an innovative and strategic approach to the floor-covering market. Instead of cranking up an old mill, Engineered Floors invested in new facilities and cutting-edge technology. The company focused on selling to high-volume customers who supply carpet to apartment complexes and other commercial establishments. After building plants in Calhoun and Dalton, he acquired residential carpet maker Dream Weaver Carpets in 2011 to connect to the retail market. Today, the company is constructing a massive 2.4-million-square-foot manufacturing plant south of Dalton that will eventually employ more than 2,000 workers. The $450-million complex will fully incorporate the carpet-making process from end-to-end and create both higher value and more profit in an industry that hasn’t seen much of either lately. When his family’s company was founded in 1946 as Star Dye Co., its job was dyeing carpet made by other producers. In those days, that was the way the industry worked. One company made the carpet from fibers manufactured by another, while a third applied the dye. Shaw saw that he needed a different, end-to-end approach if he wanted to be successful. These days, Shaw is doing battle with the biggest names in the carpet business, but unlike many industries all his competitors are within a short drive of his downtown Dalton office. Despite the resurgence in carpet, local leaders are working hard to cultivate new industries so that Dalton is a bit less of a company town. Economic developers are also on the hunt for food production companies, emphasizing access to plentiful water and city-owned utilities eager to work with new plants. Then, of course, there are all those workers and the deep heritage of industrialization that has shaped Whitfield County since the very beginning. Connecting those workers to 21st-century manufacturing jobs requires a great deal of training and retraining, but Dalton is ready. Right off I-75 is Dalton State College, and the city also boasts a campus of Georgia Northwestern Technical College (GNTC), which shares a campus with the local career academy. Even with the rise in demand for carpet that has driven hiring within the industry, many of the carpet mills that once hummed with life are unlikely to reopen. Those particular jobs won’t be coming back. In fact, never again will this region see the sheer number of mills that once dotted the landscape producing products around the clock to meet a seemingly neverending need. Today, the challenge for Dalton and Whitfield County is to take those thousands of people who were working in spun yarn plants and transition their training and their education and their work abilities into the new technologies. Many of those workers are receiving training at GNTC. The institution opened its campus here largely at the urging of local leaders and business. Its primary goal is to teach the right skills to create a workforce that can serve the changing and increasingly high-tech needs of companies. Local business and government leaders had been seeking a branch of the technical college to meet the region’s growing training needs. Since then, the college has worked closely not only with businesses in need of trained workers, but also other colleges throughout the state that have expertise and experience in creating particular types of programs. One of the first areas GNTC tackled was a program in mechatronics – the multidisciplinary field that combines various forms of technology and mechanical engineering, essentials for modern manufacturing. Since then, the college’s programs have been filled both day and evenings, and it is even considering offering classes on weekends. These courses have attracted both workers already with companies and students just out of high school, according to Mathis. Helping students move more easily from the classroom to the shop floor prompted the creation of internships that would give students real-world experience. The comeback of carpet – modest though it may be – has clearly contributed to a new level of optimism in the region. Whether it’s business operators who are selling more goods and services or a citizen on the street who finds he has more money in his pocket, there is something of a consensus that it is time to move forward again. One good indication of that change in attitude can be seen in the passage of the county’s Special Purpose Local Option Sales Tax (SPLOST) last March. By a more than two-to-one margin, voters who had turned down the last SPLOST said yes to this one and the more than $60 million in public works projects it contained. The 1 percent sales tax lasts four years and will bring in an estimated $63.6 million before it expires. The funds will go to public safety, including a digital emergency radio system for first responders, new trucks for city and county fire departments, a new fire station and new vehicles for local police and the sheriff’s department. About 40 percent goes to roads and infrastructure. The rest is earmarked for projects such as a new $5-million recreation facility at Haig Mill Lake, which includes a cross-country trail, as well as a walking trail and other improvements at Lakeshore Park. 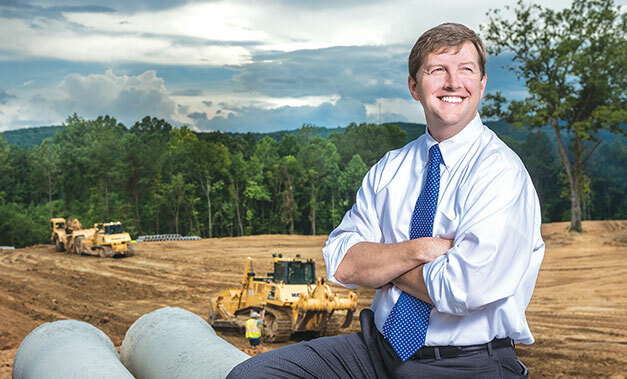 In Dalton, most see the recession at an end, but local government is still running a lean operation, according to new Mayor Dennis Mock. The upturn has permitted the city to launch a series of streetscape projects, gateway signage and traffic improvements to add more beauty and improved connectivity to the area. “Our public works department is really busy gearing up this year,” says Mock. In addition to the projects that everyone will see, the city is also making improvements and repairs to its sewers. It’s been a long time coming, but today the present – and the future – look a good bit brighter than they did before.